Big congratulations for Monkey, who won this su-purr-model honor amongst an incredibly gorgeous crowd of fancy felines -- there were over 100 photo entries in the competition! It was a tight competition right up to the very end, with the two top cat separated by only 22 votes! 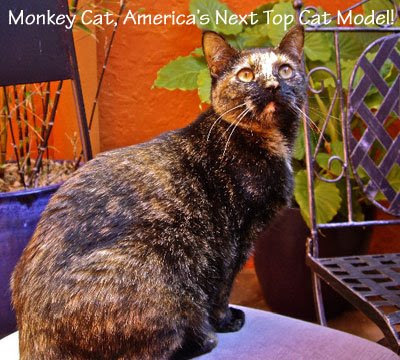 Monkey Cat's fabulous photo and sheer, natural modeling talent however earned this special win with a pawsitively impressive 30% of the votes! Monkey Cat will be awarded a $10 gift card to Petco to buy a special prize (every kitty has their own special tastes...)! Congratulations again, Monkey! Join in the celebration! Congratulate Monkey Cat by commenting below! Yaaaay Monkey! You ARE a beauty! Love those eyes!! Benigatto is sleeping (what else is new?) but I'll tell him when he wakes me up! Enjoy your prize!! Thx you everyone! This is such an honor! 1st, I wants to thank YourDailyCute for putting together a great event on a great blog! Next I has to gives BIG meow out to all the other kittehs involved..especially Misha, Lillian, Tigger & Princess! U are all top cats! Of course, I wants to thx my supporters who voted for me & helped get word out! You Guys ROCK!! Special thx to the Tortie gang who helped me pull through at the end! High Paw! Last, but not least, I couldn't have done it w/o my sis, my humans & grandma cat who hasn't been feeling so well this entire time. I thinks I will gets something for sis & grandma cat with my gift card! They deserve it for putting up with me all the time!